Bassically here is a small guide on how to get your bass pumpin', or whatever you like. First, before EQing, there is somethig that HP disables (or the sound card) by default. Go to your Control Panel, then to Sound. Once there, find the device you're using, right click it, and go to Properties. 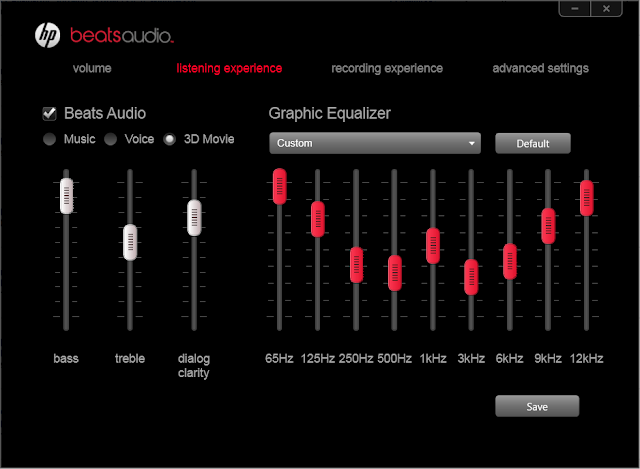 Go to the Enhancements tab, and make sure that these three enhancers are checked: Bass Management, Virtual Surround, Loudness Equalization. Each have small descripions when you select them, so you can learn about what they do there. You may need to restart your computer after this, but the effects are amazing in itself. Now lets get to EQualizer. Bass: This should never fall below 60 unless you like your music extremely facant. I like it at 100, because I like to be able to feel the bass in anything I listen too. This setting is fairly easy to tweak with. Definition: Honestly this one is kindof tricky. It seems to just make music too shallow at low levels, or too enphasized on treble at higher levels. I keep this around 50. Center: Dont move this down too far, if you do expect to only hear bass notes and vacant drums. Vocals and guitars fade as you move it down, and bass and deeper tones get washed over by treble if you slide it up. This is another one to keep near the middle. For crazy dubstep or dance, moving it down can be a plus. Space:﻿﻿ This is easily one of the most overlooked settings. The only way I can explain it, is that it litterally spaces bass and treble. As if on 0 their cramped together into on speaker, but on 100, treble is coming out of several 12" on its own, and bass is coming in on its on in the same way. Definitely keep this up near 70+ for best quality. Focus: Again, this one can easily be left at around 50. I think it basically cuts and adds midrange sounds. 31Hz and 65Hz: Both of these are bass. Generaly for a full sound, throw them up as high as you can without throwing off anything else in the song but improving bass. If too high, it can drown out the song when the bass drum hits. 125Hz: This is a hit or miss. Depending on how you like your music. For the majority of people, this should be your lowest EQ. Around -3 even. Mids can get in the way of that "space" effect. It can "throw in walls" where there was once space if too high. 250Hz and 500Hz: These can be tricky, and probably some of the two most personal depending settings. Adds and takes away mids, but not it a horrible way at all. I keep these around 0 personally. 1KHz: This can be dropped a little. This is culprit to making your music sound "canny" if too high. 2KHz, 6KHz, and 10KHz: Most of the time, it sounds nice for these to gain progressivly. IE, down make 2K higher than 10K. Another way to make music sound canny. Too little of these, and your music will sound muddy and drown out. Settings will very everytime you switch headphones to earbuds, or to internal speakers, even to external speakers. But we hope this gives you a general idea on how to find your sound. So people who are pros at EQ can take a step in, but keep that in mind.